An effective solution for protecting your tail pulley - as well as your mechanical splices and lagging - the V-Plow is uniquely designed to clean the inside (clean side) of your return belt. Positioned just prior to your tail pulley or just in front of Gravity Take ups, Vee plough will deflect material from the belt ensuring it does not go around the tail pulley causing damage to both the pulley and your belt. Vee Plough has highly durable urethane blades, which fits virtually any conveyor structure. 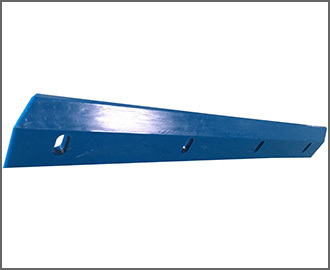 The Diagonal Plough is a versatile, economical solution for protecting the tail pulley, drive pulley, or gravity take-up pulleys from carryback materials. The Diagonal plough cleans in front of the belt pulley. 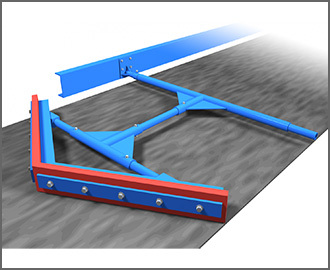 The Diagonal Plough is installed on a 45 degree angle across the belt, keeping at bay all types of debris that could cause damage to the belt, mechanical splice, lagging or pulley. 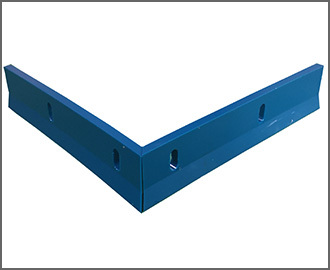 The Diagonal Plough is easy to assemble and can be placed exactly in the position required on the conveyor.